Don’t let a relatively tame week in the S&P 500 engender complacency. Perhaps it was not obvious, yet the trading week provided important confirmation for the incipient “Risk Off” dynamic thesis. Indeed, the global bear seemed to roar back to life. Stocks were lower, financial stocks were under heavy selling pressure, and some commodities reversed sharply lower, while safe haven bonds were in high demand. It’s worth noting that financial stocks lagged during the recent global risk market rally and now lead on the downside. Japan’s Nikkei equities index dropped 3.4% this week, boosting its two-week drop to 8.3% (down 15.4% y-t-d). The Nikkei closed the week at 16,107. Keep in mind that the Nikkei traded at about 20,000 this past December (and about 39,000 in December 1989), and is now only about 1,000 points off February lows. Japanese financial shares trade even worse than the major indices. Japan’s Topix Bank Stock Index sank 4.6%, with a two-week decline of 12.8% (down 32.5% y-t-d). The Topix Bank Stock index traded at 250 last summer and closed Friday at 140. Chinese stocks (Shanghai Comp) declined another 0.9%, increasing 2016 losses to 17.7%. Hong Kong’s Hang Seng Financial Index fell 5.0%, with a two-week decline of 7.6%. The Singapore Straits Times equities index lost 7.1% over two weeks, with financial share weakness behind 10 straight losing sessions. European bank stocks (STOXX) dropped 5.0% this week, increasing y-t-d losses to 22.2%. Italian banks were hammered 9.0%, boosting two-week declines to 10.8%. Italian bank stocks have lost 35% of their value already in 2016. 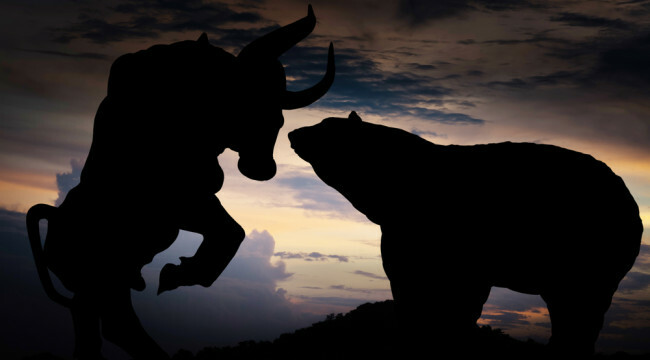 The ongoing bear market in Europe equities gained momentum this week, an especially notable development considering the extraordinary efforts of “whatever it takes” monetary stimulus. Germany’s DAX declined 1.7%, increasing y-t-d losses to 8.1%. Notably, Deutsche Bank sank 11.6% this week, increasing y-t-d losses to 30%. Major equities indices dropped 2.9% in France, 4.1% in Italy and 3.6% in Spain. European debt markets this week saw a notable widening of periphery sovereign spreads. Portuguese 10-year spreads widened 29 bps versus German bunds, Spanish spreads widened 13 bps and Italian spreads gained 14 bps. U.S. stocks performed relatively well, or at least the major indices. The S&P 500 slipped only 0.4%, although the broader market was notably weaker. The small cap Russell 2000 dropped 1.4%. Technology stocks remained under the pressure of a deflating tech Bubble, with the Morgan Stanley High Tech (MSH) index dropping 1.7% (down 5.8%). The biotechs (BTK) were hammered 5.1%, increasing 2016 losses to 23.2%. Bearish action continued to envelope the financial sector. The Banks (BKX) dropped 3.2%, boosting 2016 losses to 8.4%. The broker/dealers (XBD) sank 3.5%, increasing two-week losses to 8.8% (down 12.2%). Leading on the downside, Citigroup dropped a notable 4.6% this week (down 14.3%), with Bank of America down 3.4% (16.3%), JPMorgan 2.9% (6.8%), and Goldman Sachs 3.3% (11.9%). Consistent with the global trend, U.S. financials lagged during the rally and have now reversed sharply lower. As I have written repeatedly, I believe the global Bubble has been pierced. My view is that the world is in the initial stages of what will be a protracted bear market (at best), interrupted sporadically by policy-induced short squeezes, bouts of speculative excess and insuppressible bullishness. I believe this week marked a key Inflection Point for EM, with major ramifications for global markets and economies. With global “risk on” rapidly transitioning to “Risk Off,” developing markets – currencies, stocks and bonds – this week suffered the brunt of newfound risk aversion. The MSCI Emerging Market ETF (EEM) sank 4.7% this week. The Mexican peso fell a brutal 4.0% this week to the low since early March. Those levered in higher-yielding Mexican (or other EM) debt suffered a rough week. Tuesday trading saw the peso sink 2.5%, “its biggest drop since November 2011.” Brazil’s real dropped 1.9%, the “worst week since November.” Brazilian stocks sank 4.1%. The Colombian peso fell 3.8%. It was a global phenomenon. The South African rand sank 4.6%, as debt worries return. The Russian ruble declined 2.2%, the “worst week since February.” Russian stocks dropped 2.6%. In emerging Asia, the Korean won declined 2.7%, the Malaysian ringgit fell 2.6%, the Indonesia rupiah declined 1.3% and the Singapore dollar fell 1.3%. It’s been a few months since EM debt issues garnered market attention. Typically, so long as “money” is flowing in, EM looks good. Over recent months, “money” has indeed been flowing – though EM fundamentals remained ominous. If, as I expect, outflows gain momentum the EM backdrop could turn problematic in a hurry. Analysts took a respite from contemplating Trillions of EM external debt, much of it having accumulated since the ’08 Crisis – and too much of it denominated in dollars and other foreign currencies. Curiously, EM currencies this week under the most selling pressure were in many cases economies on the hook to Creditors for large amounts of foreign-denominated debt. It’s worth recalling that EM corporate debt is up more than three-fold since 2008 to $2.6 TN (from IIF). EM banks absolutely ballooned in the post-crisis monetary free-for-all, with considerable borrowings in dollars and foreign currencies. Earlier in the year I believed that the markets were becoming increasingly apprehensive with global inter-bank liabilities. When EM currencies and global bank shares find themselves simultaneously under pressure, as they were this week, one has to ponder the possibility that these fears are reemerging. Yet is wasn’t only EM that this week supported the “Risk Off” thesis. And I’m not so sure market confidence in U.S. high-yield is much deeper than that of EM debt. A bout of de-risking/de-leveraging would have major ramification across global financial markets. There were more Credit rumblings this week in China, along with serious cracks in the Chinese commodities Bubble. I continue to believe that the unfolding Chinese Credit crisis is the root cause of dysfunctional global financial markets. Waning confidence in Chinese finance, policymaking and economic structure will now (again) weigh on EM. The weakening dollar and attendant commodities rally had recently helped underpin the bullish EM recovery story. This week it appeared that markets began coming to grips with the reality that it’s going to take a lot more than a weaker dollar to support such highly indebted and maladjusted EM economies (and financial sectors) – as confidence in the world of finance and the global economy wane. Doug Noland began his career in late-1989, when he was hired by Gordon Ringoen to be the trader for his short-biased hedge fund in San Francisco. Later in the nineties, Noland had stints at Fleckenstein Capital and East Shore Partners. In January 1999, he began his 16 year run with PrudentBear, working as strategist and portfolio manager with David Tice in Dallas until the bear funds were sold in December 2008. From 1996-2001, Noland assisted on the Austrian economics publication The Richebacher Letter, and prior to his work in investments, he worked as a treasury analyst at Toyota’s U.S. headquarters during the Japanese Bubble period and the 1987 stock market crash. He is also the creator of the blog, Credit Bubble Bulletin.